Sonoma County is a big area to cover, and doesn’t even include Sonoma Valley, so it was a shame I was only there for two days. The first place I visited was in the Chalk Hill AVA, and was recommended to me by someone on Twitter. Rodney Strong Vineyards has a first class tasting room with a self-guided tour around the winery which explains the entire winemaking process and gives a great overview of the Sonoma history. The fruit for the wine comes from throughout Sonoma County, and are clearly the best sites for the specific varieties/blends. The style of the wine is consistent with Californian wine being fruit forward but they have a nice restraint and balance to them, particularly the Bordeaux varieties. There are several single vineyard cabernet sauvignons which are excellent, and make you wonder why you would pay so much for some Napa Valley cabernets. Rodney Strong is a sustainable business, and have a large bank of solar panels which completely power the winery. Having almost no experience with Californian wines in Australia makes it difficult to know which wineries to visit; it’s not as if they are imported in great volume and there are experts in Australia I could ask. This means than I am mostly going on recommendations from the locals, and therefore I visited Copain on recommendation from my host at Rodney Strong. 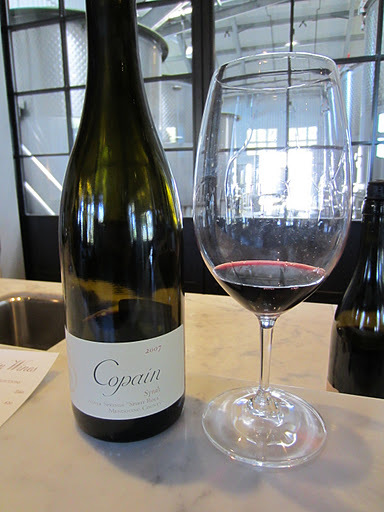 Copain is a very small operation focusing on single vineyard expressions of the Mendocino region. The wines were quite exceptional and were certainly more elegant than I had come to expect from Californian wines. The pinot noirs in particular impressed me, and served to make me look forward to visiting Mendocino even more. My only regret in visiting Copain was that I was only in Sonoma County for two days so was more interested in trying wines from that region. It’s always good to try high-quality wines though. 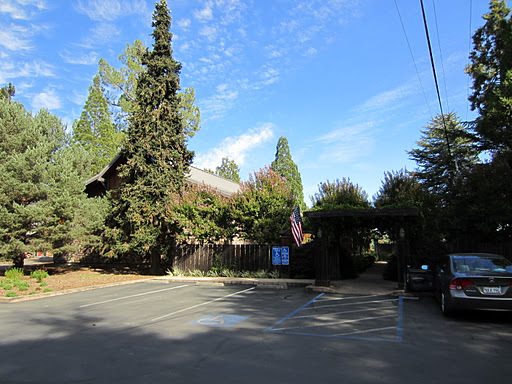 Rochioli Vineyards & Winery is a third-generation family owned and operated Russian River Valley winery, which harks back to post-Prohibition era 1938. The oldest vines interestingly enough, are the sauvignon blanc vines, and produce a very sought-after wine which sells out in a few months each year. Rochioli only produce a few estate grown wines from four varieties, which include a chardonnay, a pinot noir and a house blend of zinfandel and petite sirah. They are all very good expressions of site, and surprisingly good value. The tasting room is lovely and the staff there are very welcoming and warm. They were nice enough to call ahead to a winery for the next day who are appointment only and don’t read emails, so you have to call them. The next winery I visited sort of confirmed a rumour I heard awhile ago, but couldn’t really believe. 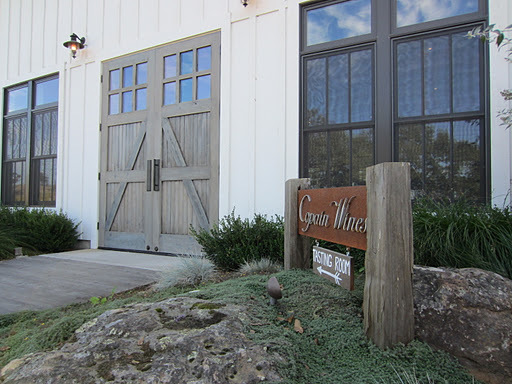 I had heard that there were wineries in California who were intentionally introducing or encouraging the fungal disease Brettanomyces (Brett) to give their wines an aged and/or old-world quality. Brett is generally considered a fault as it can dull the fruit in wine and give the aromas and flavours a slightly band-aid sour quality. In small quantities it can be considered a complex character, but for very precise and clean palates in the Australian wine industry it is almost always detected as a faulty wine. I don’t want to name the winery, but it was in the Russian River and most of the wines were good, classic Californian styles. The pinot noirs across two vintages were introduced as having Brett added, which shocked me a bit. To my nose they were obviously faulty, and to use this as a selling point was a little distressing. When I enquired as to the introduction of Brett into the wine, they said it wasn’t introduced, but it wasn’t eliminated either. The discussion related to the complex quality of French wines, which to an extent I agree with these wines have Brett in them, but it is a lot less common now that better practices in hygiene have been introduced. To suggest that these wines were more complex because of the presence of Brett I found slightly offensive, and was very disappointed that it reflected poorly on their neighbours who were making very clean and commercially sound wines. Controversial to say the least. My final visit for the day will probably be one of the most memorable of my entire trip. Kistler Vineyards are a cult icon producer in California, and have been compared to Burgundy on numerous occasions. They are famous enough that I have had the opportunity to try their wines twice in Australia, one of the only Californian whites I had ever tried. 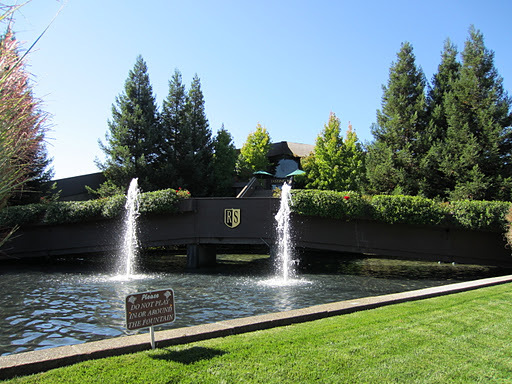 The winery was established in 1978 by Steve Kistler as Winemaker/Viticulturalist and Mark Bixler as General Manager, and quickly established a reputation for producing some of the best chardonnay in California. Depending on vintage there are as many as 12 different wines, mostly single-vineyard wines made from a careful selection of the best parcels and barrels. 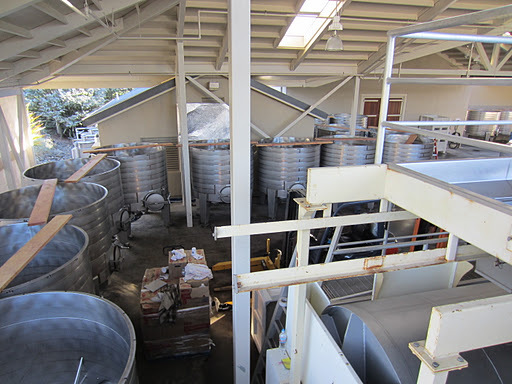 The winery itself is state-of-the-art, sparing no expense. 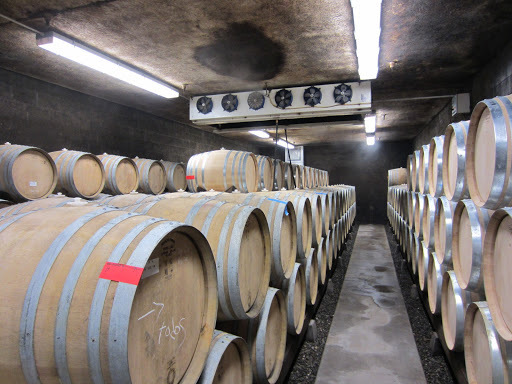 They only use indigenous yeasts in the fermentation process, use the finest fine-grained French oak (mostly from Francois Freres), and ferment the pinot noir wines in small batch open-top fermenters. 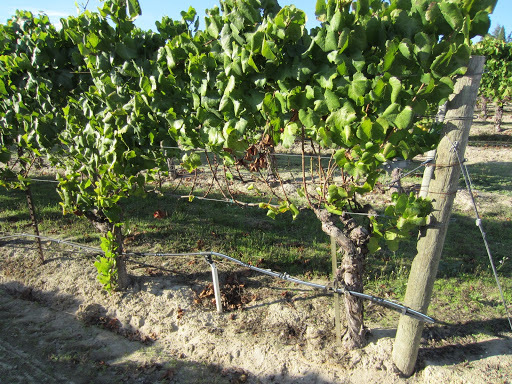 The vineyard on which the current winery is built is on a rootstock not resistant to phylloxera as the sandy soils prevent it living in the soils. Mark Bixler was generous enough to respond to the email I sent him, even though they are not open to the public. It was my good fortune that he had recently travelled to Australia and discovered many outstanding local pinot noirs and chardonnays, and was keen to chat with me about them in general. I was honoured to be invited to his house for dinner, which was awesome and filled with audio technology you would be more likely to see in a science fiction film. His cellar is a converted garage that he extended into the hill so it is underground, and he has an amazing collection, including an extensive range of Burgundian wines. He invited me to set aside anything I would be interested in trying, which flabbergasted and humbled me. I settled on such wines as a 2002 Guigal La Turque Cote Rotie, much to my protestation that it would be too young, but Mark insisted. 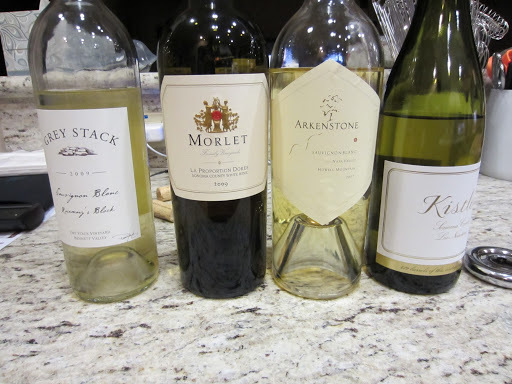 Meanwhile he set aside some Kistler and other Californian wines. We opened several wines and had a great deal to discuss about wine. Mark has had amazing experiences in his career and has met some amazing people. As I was driving I had to be careful not to drink too much, which was difficult as the wines were so good. There were several sauvignon blancs and blends that we looked at, several local and one Marlborough, which to me was a great example but still obviously Marlborough, which I had to justify that my patriotic genes meant I didn’t get excited by it. Mark had pulled out several wines from a tiny producer from St. Helena in the Napa Valley named Morlet. They source fruit from key locations in Northen California to produce in small quantities Californian expressions of very French style wines. The La Proportion Doree is a traditional Bordeaux blend of sauvignon blanc, semillon and muscadelle, and is one of the more complete wines I have tried so far. The Kistler Pinot Noir I tried was intense to say the least. It was a very dark colour, having some serious maceration from cold-soaking for several days. The nose was bold and fruity but not hot at all, something not uncommon in Central Otago pinots. On the palate it was not at all heavy, but quite soft and voluptuous. The fruit as expected was in the black forest and cherry region, but the 100% new oak was perfectly integrated. This is a big style of pinot that can only be produced in the new world, but an outstanding example. 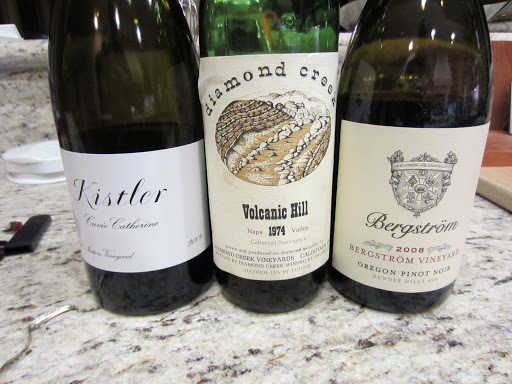 It was interesting to compare the Bergstrom Pinot Noir from the Willamette Valley with it, which showed more earthy savoury concentration. Now looking forward to Oregon as well… It was pretty late by the time we sat down to dinner through all the tasting and talking. The dinner we enjoyed was welcome respite from all the meat and carbohydrates I had been having, as it was almost entirely organic vegetables and some cornmeal with shiitake. The 2002 La Turque was indeed showing very young and tight, having some supple tannins but rocking neither Mark’s nor my world. After getting an introduction to Marks giant audio-visual set-up I had to excuse myself as it was late and head back to my motel. It was a great evening of wine geekiness, and I felt privileged to have had the opportunity to meet him. If you ever have the opportunity to try Kistler wines I’m sure you’ll understand how special they are. Click here to see more photos from Day One in Sonoma County.